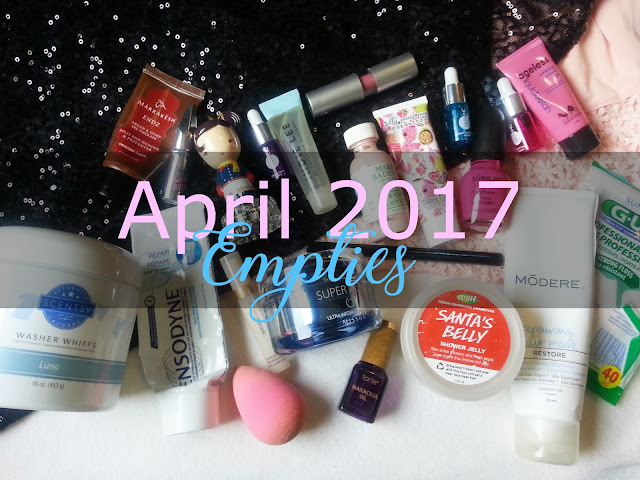 Deidre's Discoveries: April 2017 - Empties! 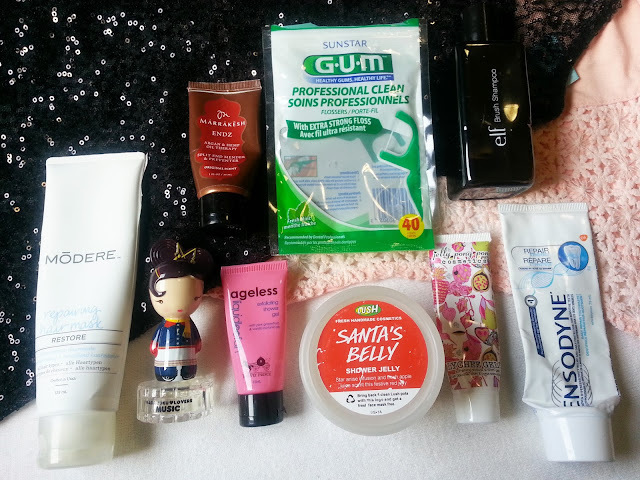 Another month has ended, and that means... it's time for empties! I love these kinds of posts! I really enjoy reading them from others, to see what they used up and liked... and also writing them! I can go back and see what I used, and if I actually liked it or would repurchase. Anyway, let's just get into it, because I have a lot this month! There's even more than what is pictured above, I couldn't fit it all in nicely! Candied Pomegranate - Cinnamon-sprinkled pomegranate and candied apple. This was a sweet pomegranate smell, it did have a light hint of cinnamon. It was from the Fall/Winter line. It wasn't bad, but I prefer the original Perfectly Pomegranate scent. Blackberry Orange Marmalade - Dark berries meet bitter orange in this fruity, fall scent. This was also from the fall and winter line. It was nice and fruity. Nothing really stood out. Welcome Home - Warm and welcoming with cinnamon and spices. This is definitely a cinnamon scent - but not candied cinnamon if that makes any sense. It's a nice scent, but I have other cinnamon scents I prefer more. These both were sent to me from my friend who lives in the US. I really enjoyed both of them! I ended up purchasing the cupcake scent because it is available here, but I couldn't find watermelon buttercream. I will have to get a bar next time I visit the states, or see if someone can send me one! I really like the Luna scent (white florals - jasmine, sweet pea, and freesia. Juicy berries, and sandalwood shimmer like moonlight.) it's beautiful as a wax bar, body products, and even in this laundry product. But I didn't find it lasted long enough on my clothing. 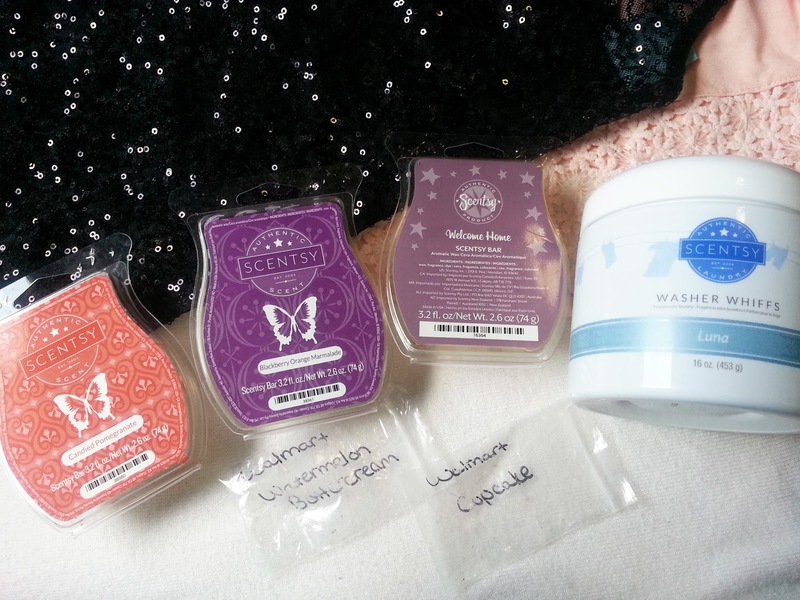 I've already repurchased washer whiffs, but in a different scent. I was having a hard time getting this really clean again, even after using beauty blender cleaner. I decided it was time to toss it, as it's also probably close to 6 months old... maybe even closer to a year. I don't even remember the last time I switched it out. Which I probably shouldn't admit, but it didn't really start to not get fully cleaned until about a month or so ago. I already have repurchased this! I love it, and I haven't found anything that applies as well as this. Sephora by OPI Nail Colour in What Aura Gonna Where? I used to love this bright pink polish. I was going through my polishes and I can't even open this one anymore, so it was time to toss. I have other similar colours, so I won't miss this too much. I really was not a fan of this eyeliner. It's a felt pen style, and I feel like it dried out too quickly, and I just couldn't get it as precise as I can with a brush tip liner. So, off it went. I wouldn't repurchase it. This is old. Like very old. This is a toss instead of an empty. The colour even looked like it was started to separate. But it was a very pretty colour. I finished this sample up, and I really liked it. 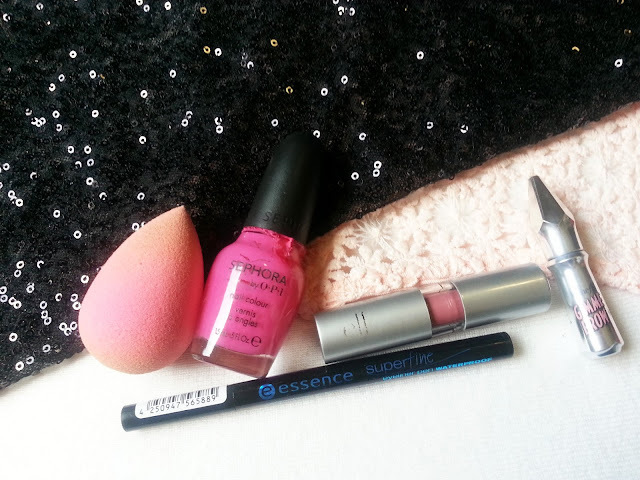 I'm using an Essence brow gel at the moment, and they are very similar. I do have another back up of this gimme brow though, that I will be pulling out once the Essence is done! Ugh. This is an expensive hair mask. I almost hate to admit that I spent $37.99 on it. This is from another direct sales company, and as I have said in previous posts, I did an order swap. Anyway, I was thinking for that price that it was going to amazing. And amazing it was not. I got only maybe 4 uses out of it, and it wasn't any thicker than a normal hair conditioner. Such a disappointment, and I will never purchase it again. It did nothing for me. This stuff is old. Like, I was in high school when I got this - old. It did still have the perfume scent, but alcohol was starting to be more strong when I sprayed it. So I did get some more use of it, but over time it just started to smell more like alcohol. It was time to toss it. I loved this! I would put it in my hair while it was damp before blow drying, and then straightening my hair. It always made it feel soft, and not dry. It kept my hair shiny. I'd definitely consider repurchasing this in the future, depending on how much it costs, and once I finish up some other hair products. Nothing much to say about these besides they are flossers. They do a good job, and I liked them. I've already repurchased another pack. I hated this shower gel. It had a bad fragrance, and it just was not exfoliating at all. I wouldn't repurchase. I loved the scent of this. It smells exactly like the so white bath bomb - so, like apples! It's fresh, and was enjoyable. I am keeping this pot so I can bring it into Lush in the future. I'd consider repurchasing this in the future. Worst brush shampoo ever. It did remove some makeup from my brushes, but not a good deep clean. And forget cleaning your beauty blender with this, it does nothing. I wouldn't repurchase this. This smelled like melted plastic. It was awful. It also didn't lather very well. Would not repurchase. I like this toothpaste. It's not as minty as I would prefer, but I hope it's repairing and protecting my teeth. I've already repurchased another. You can see my review of this here. While I enjoyed being able to customize my skincare, I didn't see any improvement in my skin, in fact I think it made my skin act out when I first was trying it out. Either way, I wouldn't repurchase the full size set. This is definitely more of a runny gel then it is a gel cream. It had a strong chemical scent, and it definitely had a cooling sensation. I didn't find it did anything for blemishes when I had them. I wouldn't repurchase this. I actually really enjoyed this oil. It wasn't too thick or too thin. It mixed well into moisturizers, my foundation, and worked well on it's own. It gave my skin the extra hydration it needed. It also had almost no scent, which is great because some oils are just oily smelling. I have another so I will definitely be using it again in the future. I got this as a sample from Sephora awhile back. I didn't see any difference in my skin, and it's also quite pricey. I won't be repurchasing this. Ah, this stuff is great. It dries out any pimples you have. I do find when I use this on a blemish, I will have to use an oil or extra hydrating moisturizer because it does dry the skin out. I haven't repurchased this, but I have purchased another drying lotion called Bye Bye Blemish, which is supposed to be a dupe. Once I use it, I will compare the two. Worst cleansing oil I've ever used. It was thick, it smelled like vegetable oil, it never rinsed off of my face, and left behind a huge oil slick. The bottle leaked everywhere and left a mess on my counter all of the time. I had to leave it sitting on a piece of folded up paper towel, because it was so messy. I would never repurchase this - and I wouldn't recommend it to anyone. This was a nice cleanser. It never left my skin feeling tight or dry. I also didn't notice any brightening effects. 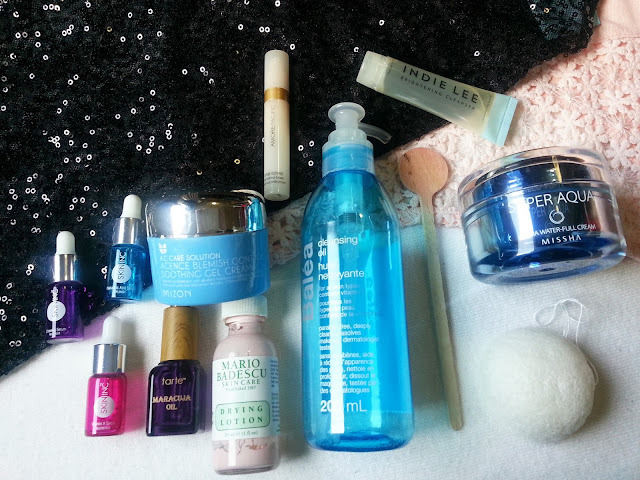 I have other cleansers I like more, so I wouldn't repurchase. I received this in my Secret Santa gift exchange in December. I love the scent of this, because it smells exactly like Snow Fairy. These bubble wands last forever, and I've already repurchased bubble wands in other characters/scents. This was more of a cream consistency, but it also was bouncy so there had to have been a little bit of gel in there. It had a very aquatic scent, which I wasn't a big fan of because it was very strong. I didn't find this hydrating enough and ended up finishing it by using it as a body cream instead of a facial moisturizer. I wouldn't repurchase this in the future. I've had this for awhile, and while it doesn't feel gross or anything, it's probably time to toss it. I like how it lightly exfoliates the skin without leaving your face red or "raw". I have another in my stash that I will use. Again, I'm not going to go into too much detail about these masks, because some are repeats. The pig mask actually stung my face a little, which is sad because I love TheFaceShop masks. The Garnier Moisture Bomb mask was just average, but fit weird, and was very sticky. I absolutely loved the moisturizing MasCream Sheet Mask (this was goat milk) - it made my skin feel so hydrated, and it glowed! 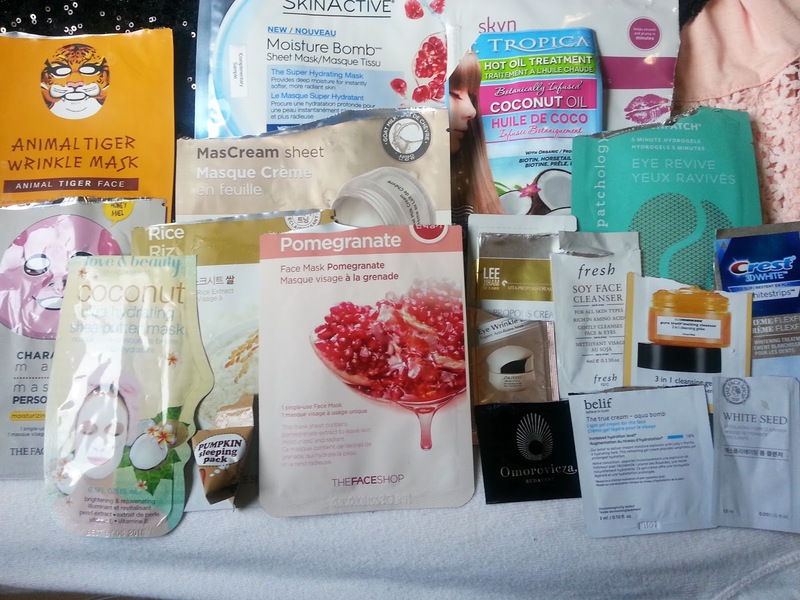 I'm definitely going to repurchase more of that MasCream Sheet Masks in the future because the ones I have tried so far, have been amazing. Um, the Tropica Coconut Oil Hot Oil Hair Treatment was a mess. It was straight up coconut oil, and just so greasy and hard to wash out. I didn't notice any difference in my lips, or under eyes with those patch masks. And I actually really enjoyed all of those foil packets! So for April, I finished up 30 products, not including masks or foil samples. Not bad!